We started in the outdoor industry in 2009 when we introduced the Blind Ambition Bale Blind. Over the years we have had tremendous success and so have our customers! 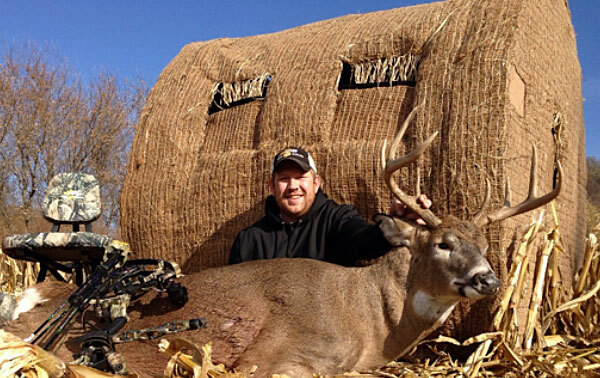 Numerous customers have harvested their personal best Whitetail, Mulie, and Antelope bucks out of a bale blind. The bale blind is the best option for archery hunting the open field and food plot areas that numerous game animals use for feeding and travel. Same day hunting success is attainable with the use of these hay bale blinds as deer, turkey, and other game animals have lived most of their lives around round bales. In 2013 Blind Ambition Bale Blinds was acquired by Redneck Blinds of Lamar, MO. Redneck is known for their high quality fiberglass blinds that truly are "The Best Blinds on the Planet." The bale blind is an awesome addition to their line and we are proud to continue with Redneck Blinds as one of their leading retailers. We will be able to offer expert advice on blind location, setup, and applications that we have found successful. Our philosophy is to provide you with the best products at competitive pricing and offer you recommendations that we feel will make you a more successful hunter. If you are looking for answers, advice, or just want to talk hunting please contact us via phone, email, or social media as we will always make ourselves available to you. Thanks for visiting our site and we look forward to helping you in any way we can.